Social Innovation is emerging as an alternate interdisciplinary development pathway of knowledge and practice that aims to understand and address contemporary complexities and multi – dimensional social realities. BEPA (2011) defines social innovation as, ‘innovations that are social in both their ends and means’. However, though Social Innovation is a widely-used term; its conceptual understanding and the specific relation to social change remains under explored. 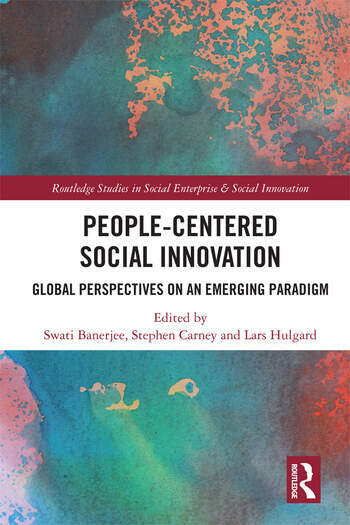 People Centered Social Innovation: Global perspectives on an Emerging Paradigm attempts to revisit and extend the existing understanding of Social Innovation in practice by focusing upon the lived realities of marginalized groups and communities. The emerging field of people-centered development is placed in dialogue with theory and concepts from the more established field of social innovation to create a new approach; one that adopts a global perspective, engaging with very different experiences of marginality across the global north and south. Theoretically, ‘People Centered Social Innovation: Global Perspectives on an Emerging Paradigm’ draws upon ‘northern’ understandings of change and improvement as well as ‘southern’ theory concerns for epistemological diversity and meaning making. The result is an experiment aimed at reimagining research and practice that seriously needs to center the actor in processes of social transformation. Social Innovation Learning from Critical Social Entrepreneurship Studies: How Are They Critical and Why Do We Need Them? Swati Banerjee, PhD is Professor and Chairperson at the Centre for Livelihoods and Social Innovation, School of Social Work, Tata Institute of Social Sciences (TISS), Mumbai, India and Co-ordinator of the Right Livelihood College (RLC) - TISS. Stephen Carney, PhD is Associate Professor in Comparative Education Policy at Roskilde University in Denmark. Lars Hulgård, PhD is Professor of social entrepreneurship, Roskilde University, Denmark and visiting professor at Tata Institute of Social Sciences, Mumbai, India.